Lovett ES fifth-grader Bryan Moore poses with his mother, Tonyamas Moore, who won the spelling bee at that campus back in 1986. 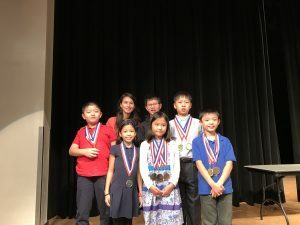 Five boys and five girls from 10 different HISD schools will be testing the limits of their vocabulary on Saturday, April 2, when they take part in the finals of the Houston Public Media spelling bee. The top two winners of the Houston-area competition will be eligible to advance to the Scripps National Spelling Bee near Washington, D.C., in May. This year’s local contest is particularly meaningful for two HISD students: fifth-grader Bryan Moore (Lovett ES) and eighth-grader Christine Bowyer (Baylor College of Medicine Academy at Ryan). This entry was posted in Achievement/Recognition, District II - Rhonda Skillern Jones, District III - Sergio Lira, District IV - Jolanda Jones, District V - Sue Deigaard, District VI - Holly Maria Flynn Vilaseca, District VII - Anne Sung, Literacy, News, Special events and tagged Baylor College of Medicine Academy at Ryan, Daily ES, Emerson ES, Garden Oaks Montessori, Houston Public Media, Key MS, Lovett ES, Ortiz MS, Pin Oak MS, Revere MS, spelling bee, T.H. Rogers on March 28, 2016 by HISD Communications. CECHS student Emerson Greer (holding umbrella) helps a Camp M.I. participant navigate a water activity. Over the past several weeks, middle and high school students from HISD campuses across the district have been volunteering at Camp M.I. 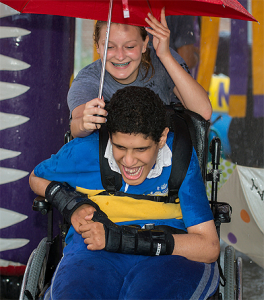 Way, a special program designed to give students with multiple impairments a chance to practice and expand their social skills in an atmosphere of fun. This entry was posted in District V - Sue Deigaard, District VII - Anne Sung, Special Education, Volunteers and partnerships and tagged Camp M.I. Way, Challenge Early College High School, T.H. Rogers on June 25, 2015 by HISD Communications. T.H. Rogers students celebrated Diwali – the Hindu festival of lights – in a special program held on Nov. 14. This entry was posted in District VII - Anne Sung, Elementary Schools, Middle Schools and tagged Diwali, T.H. Rogers on November 18, 2014 by HISD Communications. Usually, the benefits of reading include a bigger vocabulary, greater word comprehension, and better conversation skills, but dozens of HISD students received a different type of reward recently from two of the district’s community partners for focusing on literacy over the summer. Most of the students were recognized for participating in the district’s Extended Primary Year program, which was offered at 29 elementary schools. This entry was posted in District I - Elizabeth Santos, District IX - Wanda Adams, District V - Sue Deigaard, District VI - Holly Maria Flynn Vilaseca, District VII - Anne Sung, Elementary Schools, Middle Schools and tagged Foerster ES, Herod ES, Horn Academy, Long Academy, Moreno ES, Pin Oak MS, Reagan K-8, Roosevelt ES, Sugar Grove MS, T.H. Rogers, twain es, West University ES on September 24, 2014 by HISD Communications. T.H. Rogers student Phineas Armstrong was recognized recently in a somewhat unconventional manner: a baseball diamond was named in his honor—but next year, it might actually be in a different location. This entry was posted in Special Education and tagged Camp MI Way, T.H. Rogers on July 2, 2014 by HISD Communications. 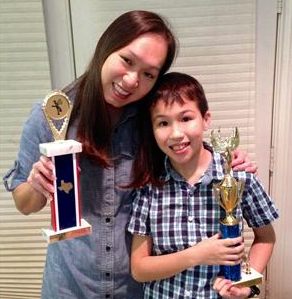 A love of knowledge and a taste for trivia have brought two students from HISD’s T.H. Rogers School recognition on the national stage. 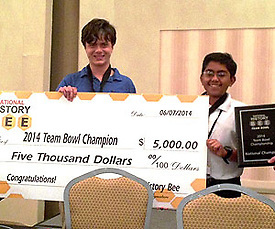 Gram Brinson, who will enter HISD’s DeBakey High School for Health Professions as a freshman this fall, and Shomik Ghose, now an eighth-grader at T. H. Rogers, won the 2014 Team Bowl Championship coordinated by the National History Bee over the weekend. This entry was posted in Achievement/Recognition and tagged T.H. Rogers on June 10, 2014 by HISD Communications. A T.H. 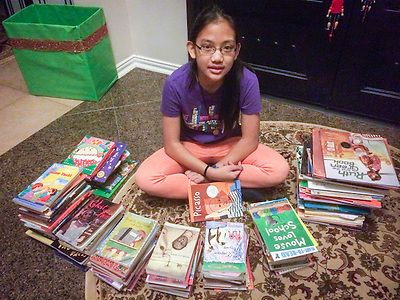 Rogers student has collected books to help rebuild school libraries that were damaged in a massive fertilizer plant explosion in West, Texas, one year ago, on April 17, 2013. Sixth-grader Camille Abaya is on Education in Action’s 2013-2014 Lone Star Youth Council, which has 27 members across the state. The group came up with ways to collect books in their areas, and Camille asked members of three different clubs to participate. She gathered a total of 114 books. This entry was posted in Middle Schools and tagged T.H. Rogers on April 17, 2014 by HISD Communications. 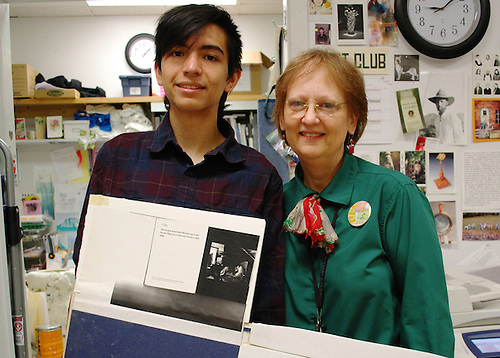 HSPVA student Patrick Zapien celebrates with sponsoring art teacher Eileen Montgomery after being named as a Scholastic Art & Writing Gold Medal portfolio winner. Six Houston ISD students have won national awards for their entries in the Scholastic Art & Writing Awards. High School for the Performing and Visual Arts student Patrick Zapien is a gold medal art portfolio winner, which earned him a $10,000 scholarship. This entry was posted in Achievement/Recognition, High Schools and tagged Bellaire HS, carnegie vanguard, HSPVA, T.H. Rogers on April 8, 2014 by HISD Communications. 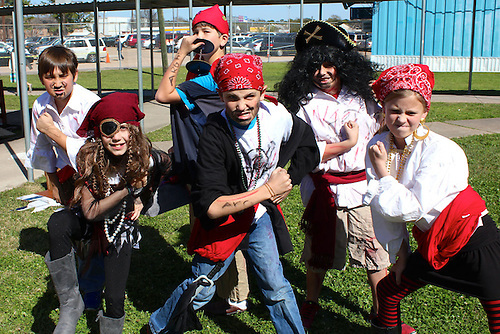 Students from Horn Academy pose as pirates for part of their Odyssey of the Mind competition. Fourteen schools participated in the state Odyssey of the Mind competition on Saturday, April 13, 2013 and students from nine of those schools will advance to the World Finals in May. Odyssey of the Mind has become the largest international creative problem-solving competition worldwide, and HISD teams have been working hard to on their projects and presentations since October. This entry was posted in Elementary Schools, High Schools, Middle Schools, News and tagged Bellaire High School, carnegie vanguard, Condit ES, Horn Academy, Odyssey of the Mind, pin oak middle school, River Oaks, T.H. Rodgers, T.H. Rogers, twain es, Walnut Bend on April 16, 2013 by HISD Communications.